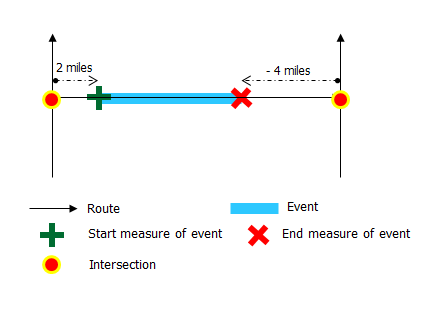 Characteristics of a route can be represented as a linear event offset from an intersection. The reference offset data is translated to routes and measures for storage. In the example below, imagine the route has the From and To measure values of 0 and 10 miles, respectively. The From measure of the event is located at a distance of 2 miles from the intersection on the left. The To measure of the event is located at a distance of 4 miles from the intersection on the right. Since the direction of calibration of the route is from left to right, the offset distance is calculated in the reverse direction (from right to left). Hence, the offset distance is shown with a negative number. Alternatively, the To measure could have been located by an offset distance of 6 miles from the intersection on the left. In the Edit Events group, click the Line Events button . The Add Linear Events widget appears. 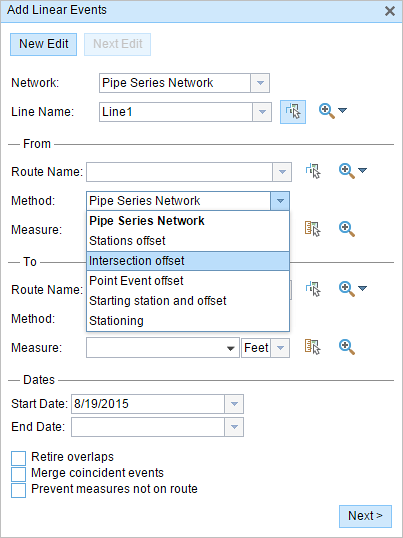 The selections for the network to and from method and measure can be configured in advance when configuring, creating, or editing the default settings for attribute sets. For more information about configuring, creating, and editing default settings for attribute sets, see Producing attribute sets and Configuring attribute sets. Click the Network drop-down arrow and choose the network that will serve as a source LRM for defining the input measures for the new linear events. The network is an LRS Network published as a layer in the Event Editor (EE). You can specify the LRS Network to be used as the LRM for defining the start and end measures of the new linear event. 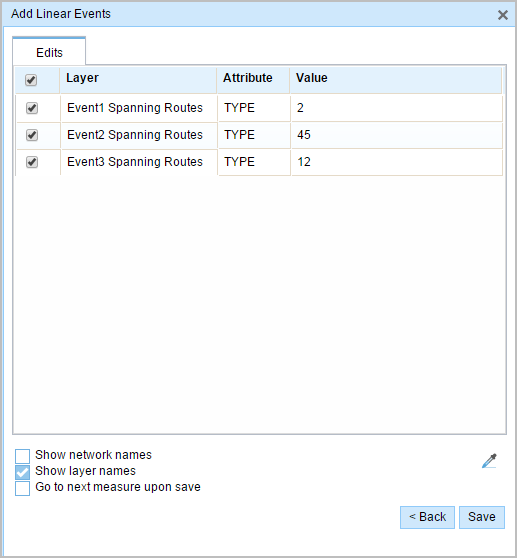 Event Editor (EE) also accepts measures in a network or LRM other than the one with which the linear event layer is associated. The new event will be associated with the routes (route IDs) from the LRS Network with which the event location intersects. Click the drop-down arrow to choose the line name in the Line Name text box. Click the Select a Line on the Map tool and select the line from the map. If the selected line is not in the active view of the map, click the Zoom to the line extent or center on the line start or end point on the Map button to refresh the map display to zoom in to the entire extent of the selected line. The line is highlighted in light blue. The arrow at the end shows the direction of calibration of the line. In the From section, click the Method drop-down arrow and choose Intersection Offset (Intersection layer name with offset suffix). All the intersection point layers that are published with the map service and are registered with the chosen network appear in the drop-down list. 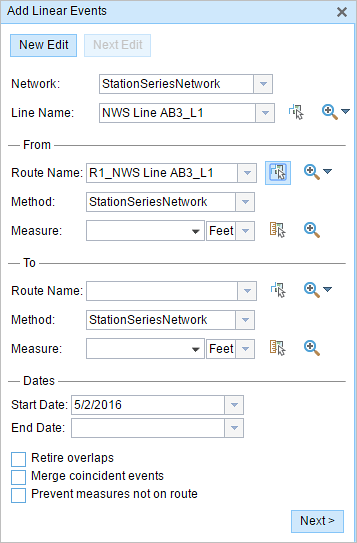 Click the Route Name drop-down arrow and choose the route on which the event's From measure will be located. Click the Select a Route on the Map tool and choose the route on the map. Only routes that are part of the chosen line can be selected. Type the intersection name in the Location text box. Click the Select a Location on the Map tool and choose an intersection point feature that participates in the layer selected for offsetting on the map. Click the Location drop-down arrow and choose an intersection. Only intersections that are part of the chosen route can be selected. Choose the direction of the offset using the Direction drop-down arrow, type the offset value, and choose the units. Type the value and choose the units. Click the Select an Offset Location on the Map tool and select a location along the route on the map. A green plus symbol is placed at the offset location along the route on the map. This is the location of the From measure value for the events. This value denotes the distance between the chosen intersection and the proposed From measure on the selected route. The direction is an optional selection. If no direction is selected, a positive offset value will place the From measure location along the direction of calibration from the selected point feature. If no direction is selected, a negative offset value will place the From measure location opposite the direction of calibration from the selected point feature. For the To measure value, repeat steps 6 through 9 in the To section. A red cross symbol appears at the selected location on the map. Type the start date in the Start Date text box. Click the Start Date drop-down arrow and choose the start date. The start date defaults to today's date, but you can choose a different date using the date picker. The end date is optional, and if it is not provided, the event remains valid now and into the future. Type the end date in the End Date text box. Click the End Date drop-down arrow and choose the end date. 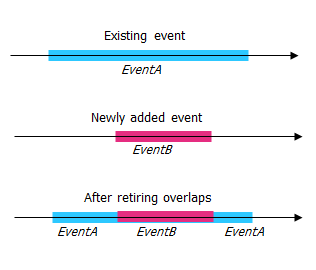 Retire overlaps—The system will adjust the measure and start and end dates of existing events in such a way that the new event does not cause an overlap with respect to time and measure values. 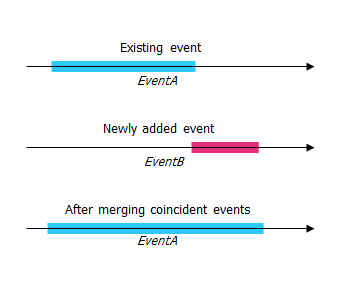 Merge coincident events—When all attribute values for a new event are exactly the same as an existing event, and if the new event is adjacent to or overlapping the existing event in terms of measure values, the new event is merged into the existing event and the measure range is expanded accordingly. Prevent measures not on route—This data validation option ensures that the input measure values for from measure and to measure values fall within the minimum and maximum range of measure values on the selected route. The tab showing the attribute set for the events appears. You can use the check boxes to add data for specific events within the attribute set. No records are added for unchecked events. Type the attribute information for the new event in the tables defined by attribute sets. 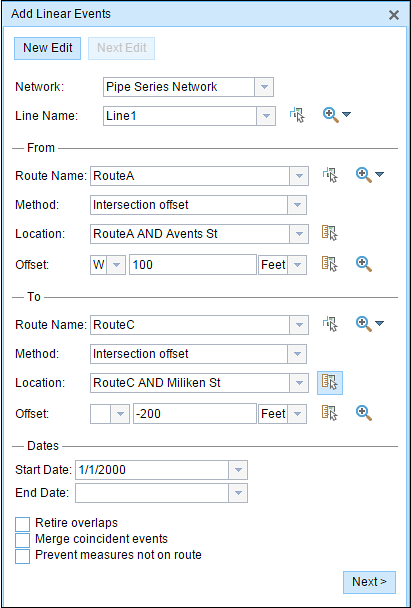 Click the Copy Attribute Values button and click a route on the map to copy event attributes from another route. Event Editor uses a default attribute set on the Edit tab. You can modify the attribute set to create custom attribute sets or use the administrator-configured attribute set. Coded values, range domains, and subtypes are supported when configured for any field in the Attribute-Value table. Check the Show network name check box to show the LRS Network associated with the selected event layer. The list of attributes in the tables defined by attribute sets can be from more than one event layer. If you want to identify the source event layer for each attribute, check the Show layer names check box. Checking the Go to the next measure upon save check box results in prepopulating the From measure value using the To measure value of the present section to continue the event creation process. The new linear events are created and appear on the map. A confirmation message appears at the lower right once the newly added line events are saved. Click New Edit to clear all the input entries in the widget and restore the default values from the geodatabase to the table. Click Next Edit to retain all the existing entries in the widget and the attribute set for convenience and for quick editing of similar characteristics.